The European Parliament: An Environmental Champion Now and in the Future? | Environmental Europe? If you care about climate change and the environment, you may find yourself wondering who will champion environmental issues in the EU after the upcoming elections in May. So far, the European Parliament (EP) has often been perceived as the EU’s ‘Green Champion’, i.e. its greenest institution. In this blog post, we shed some light on the greenness of the Parliament. Second, by considering recent polling data and key parties’ manifestos we argue that the EP’s environmental performance over the next five years depends critically on how European citizens vote in May 2014. How green is the European Parliament? What factors influence the votes of Members of the European Parliament (MEPs)? 1. Power. The European Parliament has slowly but surely evolved from a consultative, opinion-giving body (until the late 1980s), to a full-fledged co-legislator on par with the Council, which represents the Member States. While different legislative procedures cohabited during the 1990s and 2000s, the Lisbon Treaty (2009) introduced the “normal legislative procedure”, which made the European Parliament as powerful as the Council in lawmaking. Changes in the EP’s power are thus supposed to lead to changing behaviour of MEPs – becoming more “responsible”, that is, less radical, as illustrated by Ripoll Servent in the field of civil liberties. 2. Membership. The European Parliament consists of directly elected MEPs from all EU Member States. This means that a change in EU membership influences EP membership, with new Member States gaining seats. In order to stop the Parliament from becoming so large that it cannot operate effectively, old Member States had to give up seats (thus compared to 2007, the UK will have lost 5 MEPs, with only 73 seats). If MEPs vote in their national interest, this could mean a significant power shift. 3. Political ideology. The third driver is political ideology, which contends that MEPs vote along ideological lines. Most of the MEPs belong to one of Europe’s thirteen political parties, which run the election campaigns. Within the Parliament, MEPs organise themselves into currently seven political groups, which broadly align with the European Political Parties (however, some groups are coalitions of smaller parties). Each European election changes the political balance inside the European Parliament, although no single political group has ever held a majority. Recent empirical evidence collected by Burns and colleagues from thousands of ‘green’ amendments by the EP suggests that “[…] the EP is not particularly environmentally radical and appears to have become less radical, but more successful, over time […].”. The three factors detailed above help explain this development: increase in legislative power/responsibilities, a growing number of MEPs from ‘less green’ Central and Eastern European countries and the strength of EPP (the European mainstream right wing political group/party) in the current Parliament. Political ideology appears to be strongest, however. For example, Hix, Noury and Roland have demonstrated that MEPs vote overwhelmingly along party lines and not according to their national interest. Enlargement has also had an important impact on environmental legislation in the EP because, as Burns stresses, it brought no new MEPs for the Green Party, diminishing its proportional strength and highlighting the geographical dimensions of the Green vote. Lastly, considering political ideology, Burns and colleagues contend that EP amendments have been increasingly successful because the EPP (Christian Democrats) has been the strongest party in both the EP and in the Council for the last five years. Thus, the relative power of parties or political groups (within the EP) goes a long way to influencing the EP’s environmental ambitions. This means that the greenness of the future EP depends critically on the results of the upcoming European election. EP 2014: Where do we stand on the Environment? In the latest polls available at time of writing, the centre-right wing European People’s Party and the Party of European Socialists (in the European Parliament, the group is called Socialists and Democrats, or S&D) are very close; with PollWatch predicting a slight lead for the PES. The liberal ALDE group is third, the radical left GUE-NEL is fourth. The Greens are currently predicted to come 6th (down from 4th position), behind the conservative ECR group (which count British Conservatives MEPs as members). The loss for the Greens (expected to be of more than a third of their MEPs) will likely weaken environmental positions in the European Parliament. But will that loss be compensated by the general shift to the left of the institution? Comparing election manifestos is a crude but useful way to understand how European parties view environmental issues. While the European Green Party mentions the environment 28 times the other main parties mention it only 6 times (ALDE), 3 times (PES) and 1 time (EPP). Interestingly, however, the Green Party manifesto is also considerably longer than those of the other parties. More important than simple figures, is the context in which the environment is mentioned. The PES/S&D (centre-left Socialists and Democrats) manifesto mentions the “protection of environmental standards” in relation with trade negotiations with the USA (TTIP), to the European citizens’ right to a “safe living environment”. In favour of a “Green Europe”, they “support clean technology and environmentally friendly production” and contend that “EU must regain global leadership on the protection of nature and natural resources and the fight against pollution and climate change’. The EPP (centre-right Christian Democrats) “strive for sustainable growth based on a competitive and innovative economy, while respecting the environment”. They further contend that “We are determined to combat climate change through more efficient use of energy and investment in renewable energy while preserving Europe’s industrial base through affordable energy prices”. ALDE (liberals)mentions the environment in relation with proposals to “phase out environmentally harmful subsidies”, to “ensure environmental and ecological sustainability for future generations“, to observe the “three pillars of sustainability”, “environmentally- friendly tourism and agricultural technologies” with respect to the CAP, and more generally aims at “transitioning into sustainable development through a resource-efficient and low-carbon economy”. Predictably, the European Green Party mentions the environment in the vast majority of their political demands. These include a ‘Green New Deal’ focused around expansion of renewable energies, and coal and nuclear energy phase-out. In addition, they oppose using food crops for biofuel production, and they seek to ban hydraulic fracturing (fracking) as well as the import or cultivation of genetically modified organisms (GMOs) in Europe. The manifesto often links environmental issues with social justice and economic concerns. 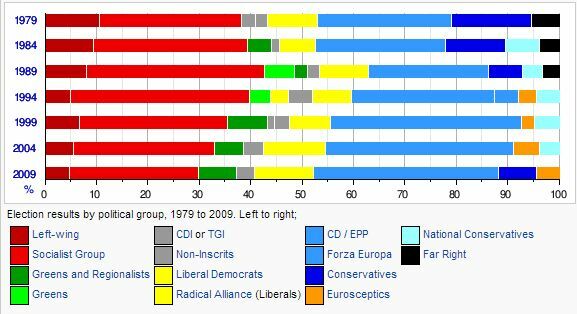 While the European Left Party does not appear to have released an election manifesto for 2014, according to Vote Watch, voting records from the Confederal Group of the European United Left/Nordic Green Left – GUE-NGL’s (which encompasses the European Left Party), shows significant convergence with the Green Party (70%) and PES/S&D (60%). Conversely, the overlap with ALDE (Liberals) is 50% and with the EPP 43%. There are key differences between GUE-NGL and the Greens, however. For example, GUE-NGL opposes emissions trading to curb climate change, but they are slightly less concerned about biofuels. From this comparison, it is clear that the environment will benefit if the PES, not the EPP, were to be the main party in the European Parliament. Paradoxically then this new Parliament may be composed of MEPs caring generally more about environmental issues – despite a reduction in the number of MEPs caring primarily about these issues. The election will determine whether the S&D, ALDE and the Greens will command enough votes to build a majority. But in an institution where coalitions are built on an ad-hoc basis, the election will not determine which coalition the S&D will prefer on key environmental, energy or climate change policies: a coalition to its left, with the Greens and GUE-NEL; a centre coalition, with ALDE and the Greens, or a German-style grand coalition between the S&D and EPP. This entry was posted in Current Affairs, Democracy & Citizenship, Energy & Climate Change, Environment, Politics & Public Policy, The EU and tagged Environment, environmental policy, European Elections, European Parliament, Political Parties, UK. Bookmark the permalink. Next: Can Canada Save Europe from Energy Dependency on Russia? One Response to The European Parliament: An Environmental Champion Now and in the Future?